Preheat oven to 325°F. Spray 9 (4-ounce) custard cups with nonstick cooking spray. Divide bread cubes evenly among custard cups; bake 10 minutes. Sprinkle evenly with cranberries. Combine remaining ingredients in medium bowl. Pour into custard cups over cranberries. Let stand 5 to 10 minutes. Bake 25 to 30 minutes or until centers are almost set. Let stand 10 minutes before serving. *Note. Do not use instant pudding and pie filling mix. 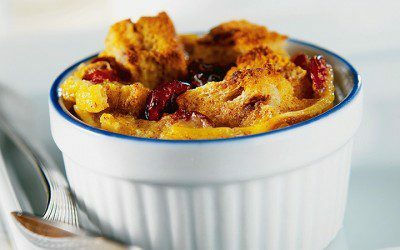 Serving size: 1 bread pudding. Exchanges per serving: 1 Bread/Starch.